that looks like the woman who’s ready to become the 45th president of the United States of America to me. but it might be an UPHILL BATTLE! I just found out that the Elephant vote is a demographic that doesn’t exist because no elephants are registered voters in America. and neither are tigers and seagulls. so that endorsement yesterday was completely USELESS, GARY! 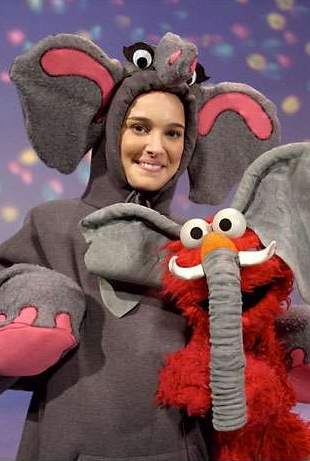 and so was this photo shoot of Natalie dressed as an elephant with Elmo Monster. HERE is the our first campaign poster I made using the computer website! IT’S EXCITING! if you’re not registered to vote you should go out and find out how to do that! I bet your mom and dad could help! tell them it’s for PORTMANIA! I also used the computer web to look up NATALIE PORTMAN NEWS. this might have been on the site a few months ago, but here’s the story of the little boy who got called Natalie a lot. the story is about a young guy named Clyff who had long hair and looked exactly like our Natalie. here’s a quiz you can take about Which Natalie Portman Character Are YOU? You are a quirky old soul, and because you’re not like most people, you have the tendency to attract others with ease. While you may throw the occasional temper tantrum, you mostly hold back your anger until moments when it’s really called for. Some may criticize you for having somewhat of a “wandering hippie” approach to life, but you’re too confident to care what they say. This has been DAY 2 of THE WORST PORTMANIA EVER. DAY 3 will be tomorrow if we’re going by numerical order. which I think is a good idea. until then join the PORTMANIAN parade outside and kiss a frog. Thank you Rachel for making a thing that was beautiful. and thank you other people for reading an update for nothing. If Portmania were a political party, I guess the mascot would be an elephant…although, I think that might be taken.